Talking to yourself is often viewed as a sign of severe mental illness. Yet there are many people who to talk to themselves — both silently and aloud — and it’s not a predominant symptom of any mental illness. 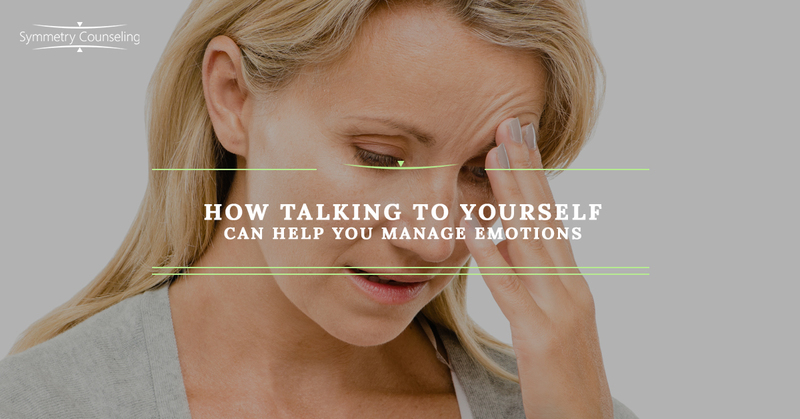 In fact, research has found that talking to yourself, sometimes called “self-talk,” can help you to manage your emotions — as long as you speak to yourself in the third person. Surprised? Here’s how it works. Researchers at Michigan State University conducted a study in which they measured the brain activity of participants who viewed disturbing photos while they silently talked to themselves in the first person (“I will be OK”) and the third person (“Amanda will be OK”). They found that the brain activity associated with emotions quickly decreased when people spoke to themselves in the third person. A group at the University of Michigan conducted a similar study, measuring the brain activity of participants as they thought about painful memories and talked to themselves using first-person and third-person language. The results indicated evidence of emotional regulation when participants used third-person language. Why does talking to yourself in the third person—as if you were talking about someone else—help you to regulate your emotions? Michigan State University’s Jason Moser reported that third-person self-talk “helps people gain a tiny bit of psychological distance from their experiences, which can often be useful for regulating emotions.” This distance allows you to reflect on yourself and your situation as you would another person. For example, if someone named Casey felt anxious about an important meeting, they might say, “Casey is going to be fine,” as opposed to “I’m going to be fine.” Give it a try and see if you notice any difference in how you feel. What is Anna feeling right now? Why is Anna feeling this way? What does Anna need to feel better? Anna is going to be OK.
Anna knows that this feeling will pass. Anna has done this before and she’ll be fine. Anna has been through worse than this. Discussing the studies, University of Michigan’s Professor Ethan Kross said: “What’s really exciting here is that the brain data from these two complementary experiments suggest that third-person self-talk may constitute a relatively effortless form of emotion regulation.” In short, it’s an easy way to manage your emotions. Why not give it a try? Do you struggle to manage your emotions? If so, you might benefit from working with a counselor to learn additional methods of emotional regulation. Contact Symmetry Counseling at 312-578-9990 to schedule an appointment.